Logic Pro X and MainStage 3 have just been released over at the Mac App Store, with an accompanying Logic Remote app having also been made available via the iTunes App Store. 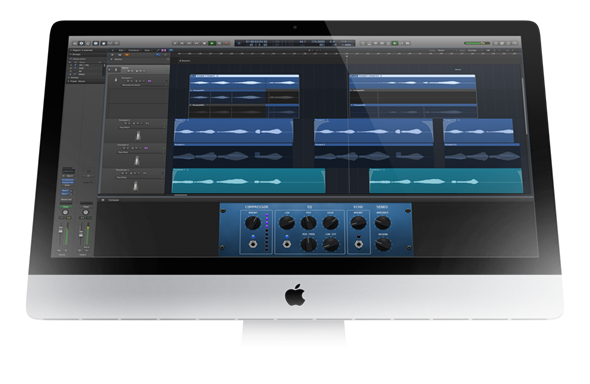 Logic has long since been a big player in the game of music production and audio editing, and the new Logic Pro X, which retails for the recognized price of $199, will be looking build upon this with a host of new and exciting features. As outlined in the press release note by Apple today, Logic Pro X boasts an intriguing new feature called Drummer, offering a virtual session player that “automatically plays along with your song in a wide variety of drumming styles and techniques.” As well as that, there’s also Flex Pitch, which offers what Apple describes as “integrated pitch editing” for audio recordings. The Logic Remote, which is currently only available to iPad users, allows Logic Pro X to be controlled straight from your Apple tablet, meaning you needn’t be stuck at the desk if you want to create or edit some of your music. For the price, Logic has always given plenty of bang for the buck, and while the update should be seen as incremental rather than significant, it would appear as though enough has been bundled in here to keep music makers happy for the time being. In a way, sometimes it’s better to keep a good piece of software as it is, rather than meddling with something that isn’t broken for no good reason. Apple already tried this with Final Cut Pro X’s largely unnecessary overhaul that did away with some key features, but at least it appears that Logic users won’t be facing the same fate. MainStage, which serves as a companion app for Logic, has also been given an update, with a new user interface and a couple of added features now making it even easier to help you turn your carefully curated music and your Mac into a concert-ready performance studio. For your convenience, we’ve linked all the downloads below. If you’re planning to dive into the world of music and are looking for the right apps, you now know where to start from!